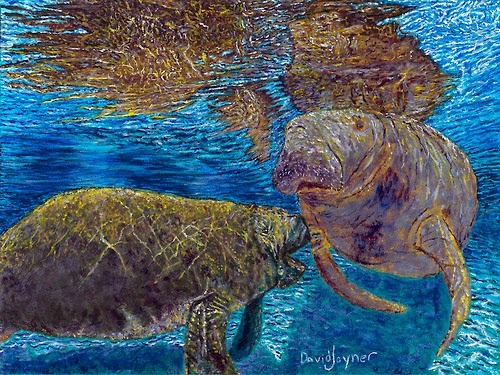 Self-taught, Florida artist David Joyner began his art journey through drawing and a profound belief from his mother that he could be an artist. David grew up drawing, finding companionship in pencil and paper. It wasn’t until 2013, however, that he came to painting, entering Jerry’s Artarama and purchasing the basics. Catching on quickly, David realized he need professional grade supplies. “As for the surface, I was sold on Ampersand from the very beginning. There was no canvas to stretch, so I am able to dedicate more of my time to painting. I love using the cradled panels so that I am able to wrap the paintings around the edges. This sets me apart from other artists. For someone who knew absolutely nothing about painting, Ampersand made learning much easier,” he shares. David uses both Hardbord and Aquabord and encourages new artists to experiment to find their preferred panel type. Stunning work, David! I love your sensitive portrayal of these creatures in their environment. Thank you, Susan! I am sorry about the late reply. I didn't know I had a comment.